Just saw this cool idea on the Craftzine blog: How to Make a Rolodex into a Craft Resource Center. Color Samples. Make notes of how many parts of each color you used to come up with this particular shade (more info here). Glue on a sample of the baked clay. File under "Colors." Texture Samples. Whether you're using store-bought texture sheets, or your own homemade tools, it might be handy to know how you created a certain effect. 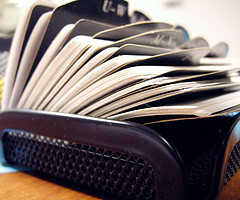 Glue a sample of the baked textured tile to your rolodex card. File under "Textures." Pearl Ex Colors. Same idea as the Pearl Ex Color Strip -- you could file individual powder colors or a whole color strip. File under "Powders." Pasta Machine Settings. I'm always wondering what pasta machine setting I ended up using for some project or other. Make & bake some tiles, numbering them according to which pasta machine setting you used. If you wanna get ambitious, make a note on the rolodex card saying how that setting relates to other pasta machine brands' settings. These samples might be better in a plastic baggie (instead of glued) so you can easily take them out and compare thicknesses. File under "Pasta Machine Settings." I'm sure there's all sorts of other things this would be handy for keeping track of. Any ideas?